Heaven is just a kiss away over at Cohiba Villas – an exceptionally fine villa getaway in Bolabog/ Balabag, Aklan Province – that is just a 5-minute ride or 15-minute walk towards White Beach of Boracay Island. You are definitely in for lots of loving as you dip into their oh-so-cool, infinity pool, and have a happy tummy out of all their delicious dishes in their own restaurant, as you are served by their ultimately courteous and cheerful staff. No need to fret though about how to get to Stations 1, 2 or 3 of Boracay because Cohiba Villas will assist you every step of the way, through their friendly staff and free shuttle service to the mall every hour from 8am to 12 midnight. 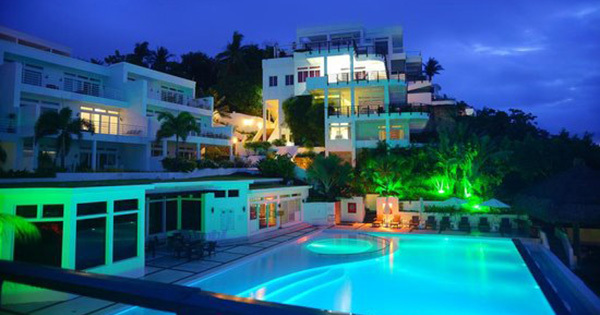 Since Cohiba Villas is situated on a hill, close to Boracay Ocean – expect total peace and quiet, plus awesome views of the windsurfing/kiting bay – where water sports enthusiasts display their skill from November to April each year. Indeed, upon stepping into any of Cohiba Villa’s apartments – which are the largest on the island, mind you, you wouldn’t be able to resist heaving a sigh, for the amazing interior and veranda scenery! The longer you stay in Cohiba Villas, in fact, the more you realize how wonderful it would be to live there someday. Just picture this – enjoy cooking your own meals with their fully decked out kitchen, without having to sweat it out, due to their lovely, super cool air conditioning! Not to mention, have those precious moments with your spouse, and/or other loved ones, in front of a large flat screen TV – loaded with multiple cable channels, as you all unwind after a sumptuous dinner and all-day fun at the beach. All of these reasons and more are yours for the taking! Come and visit Cohiba Villas soon, and see for yourself!